Eight essential skin benefits. One simple step to flawless. Too good to be true? CC’ing is believing! Mary Kay® CC Cream Sunscreen SPF 15* acts like makeup to instantly correct complexion imperfections while formulated like skin care to help nurture skin’s beauty tomorrow. So remarkably lightweight, you’ll look naturally flawless as if wearing nothing at all. From instant brightening to protection against future damage, hours of hydration to diminishing the look of blemishes and redness, this silky formula leaves skin looking healthier, younger and more vibrant. It’s a can’t-miss if foundation is more coverage than you need, or you want an easy, out-the-door option without that “made up” look. It also works as a light, skin-perfecting tinted base under foundation for added coverage. The lightweight pigments blend easily with a broad range of skin tones. Just four shades cover all skin tones, making it easy to choose your perfect match. Plus, the long-lasting formula is suitable for all skin types, including those with sensitive or acne-prone skin. 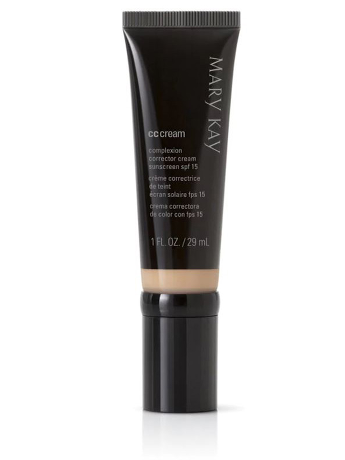 Mary Kay® CC Cream Sunscreen SPF 15 can be worn alone or as a lightweight tinted base under foundation. It helps prime the skin while helping to extend and improve foundation wear, so foundation stays fresh all day. Apply to entire face and blend gently with your fingertips to achieve a natural-looking glow. Apply liberally and evenly 15 minutes before sun exposure. Reapply at least every 2 hours. For use on children less than 6 months of age, consult a health care practitioner. Use a water resistant sunscreen if swimming or sweating. Warnings: For external use only. Do not use on damaged or broken skin. If rash occurs, discontinue use and consult a health care practitioner. When using this product keep out of eyes. Rinse with water to remove. If swallowed, get medical help or contact a Poison Control Center right away. Keep out of reach of children. Contains: Oxybenzone. Do not stay too long in the sun, even while using a sunscreen product. Store at 25° C (77° F). Do not freeze or refrigerate. Willow bark extract contains a natural form of salicylic acid. Antioxidants including vitamin E and silymarin extract, are known to help defend against skin-damaging free radicals. Suitable for all skin tones and skin types, suitable for acne-prone skin, suitable for sensitive skin, oil-free, fragrance-free, non-comedogenic, dermatologist-tested and tested for skin irritancy and allergy. Referred to as a “Complexion Corrector,” Mary Kay® CC Cream Sunscreen SPF 15 delivers eight benefits in one step to leave skin with a flawless finish. To help keep you looking younger longer. Sunscreen SPF 15 helps prevent sunburn that can contribute to the visible signs of premature skin aging. Instantly amplifies skin luminosity and brightens the complexion. It contains niacinamide and ascorbyl glucoside, which are known to help skin’s tone look more even and brighten the look of skin. Radiance is enhanced as the formula helps correct the look of skin discolorations and gives skin a more unified tone. Provides visible relief and minimizes the appearance of skin redness. It’s formulated with vitamin E and a botanical extract which are known to help calm and soothe skin. Mary Kay® CC Cream Sunscreen SPF 15 was even tested on women with rosacea who agreed it helps diminish the look of redness. Instantly conceals the appearance of blemishes. It also helps fade the look of marks from past breakouts. This lightweight formula also conceals dark circles and dark shadows as it blends beautifully with your skin tone. For 10 hours. Skin feels instantly hydrated. Formulated with emollients that help hydrate skin, Mary Kay® CC Cream Sunscreen SPF 15 provides nourishing comfort without feeling oily or greasy. Fine lines appear less noticeable, so skin looks younger. It also helps minimize the appearance of pores while visibly improving skin’s texture. It doesn’t settle into fine lines and pores, so you’re left with a smooth-feeling, flawless-looking complexion. Against environmental stressors. Mary Kay® CC Cream Sunscreen SPF 15 contains powerful antioxidants, including vitamin E and silymarin extract, known to help defend against skin-damaging free radicals. †Results reflect the percentage of women who agreed with the statements in a two-week independent consumer study. †Results reflect the percentage of women who agreed with the statements in an independent consumer study during which 291 women used the product once a day for two weeks.